The largest city of the country becomes the sixth most water stressed city of the world, this is how the figures are moving for Pakistan and the public cannot just stand this made worse by the dual standards of their governors. We all can talk hours about where the problem roots to but before that, it would be better to first develop an idea of how bad the situation really is. Karachi is a city blessed by both land and sea which has contributes to its importance from a socio-economic perspective. Right from the early days of Pakistan Karachi enjoys the position of being an industrial hub with a massive contribution of 25 percent to the total GDP. Being the largest and most industrialized, it is also densely populated but sadly, still facing the basic problems of water, electricity and waste management. Being listed as the sixth most water stressed city in the world was not a guess or estimate, in fact, this category was presented by the World Bank itself. Now, as time is moving by the water per capita crisis is getting even worse and it is only in a short while that the listing goes to higher ranks; something certainly not to be proud of. People have amalgamated the content and derived to main reasons for this massive water scarcity. The first major reason is the water loss that occurs during transition i.e taking the water from its source to the point of utilization. In figures, about 30 percent of the water is lost in this process. The second reason is clearly lack of any proper technology to recycle the water and make it available for residents. Moving aside from these two reasons, is there anything else that may have contributed to the problem or raises doubts about the current water situation? Yes, most certainly the role of Sindh Government in this issue has raised a lot of unanswered questions. MQM and PPP are the two political parties in power here and both of these parties have done nothing but disappoint the inhabitants of the area. It is discussed amongst people that the water has been sold off by these parties to the real estate developers who now decide how to distribute it. Tanker mafia is another problem that has arisen as a result of such careless attitude by the government. 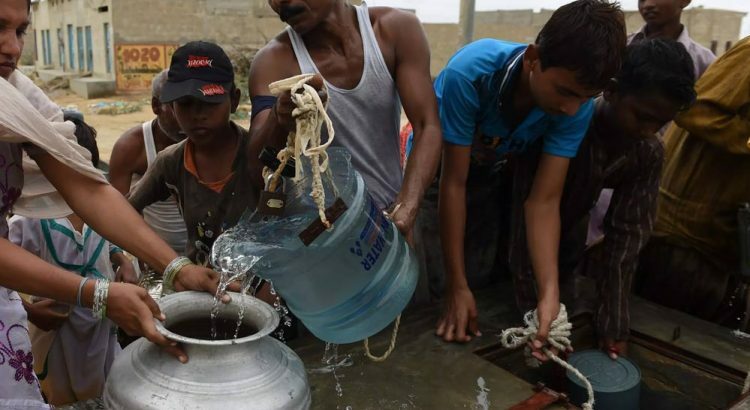 In Karachi, since most of the areas are not supplied water throughout the day, people have to instead buy the water in forms of tankers for their daily usage. Tanker mafia has now taken advantage of the situation by making sure that public water does not reach the people in any way. They attack pipelines and try other activities to hold off the water so that they can then step in with their high priced water tanks. Another question which arises here is whether or not there really is a water scarcity or the people are being “made” to believe so. People wonder how exactly the tankers are filled with water when the government claims that there is a major water shortage. The water tanks are available 24/7 with water, so as long as the public is spending their money the water is available for them. All these things make the public double minded about the government and considering their performance in the last few years, it all repeatedly points out to the same doubts. The rising temperatures of the city in summers make the situation even worse. The recent heat wave in Karachi took lives of more than 60 people; all dehydrated by the unavailability of fresh and cold water. Despite the scorching heat, people still play their part in constant protests and holding banners hoping that it will put some sense in the “apparent” leaders of the city. Hundreds of ways have been proposed to overcome this scarcity where both the public as well as the government needs to contribute equally. The duty cannot just be put on one authority rather it is the cooperation of each and every person in Karachi that will work towards solving the issue. Not just Karachi, the whole of Pakistan needs to play their part and ensure that they don’t waste water. Just because they have access to water today does not mean that they will be assured for its supply tomorrow. In fact, it has been estimated that by 2025, Pakistan will have used all its water supply and therefore will be no better than areas like the Saharan region. This should serve as a wakeup call to people and the government to think beyond their own self. As for the people of Karachi, maybe turning on the tap will give them an idea of what’s to come if things continue the same way.